It feels good to be able to just chill out and have time for cooking again after such a long hiatus. Man, all the food inspirations have all just come flooding back in and I’ve been getting good vibes from the food gods above. 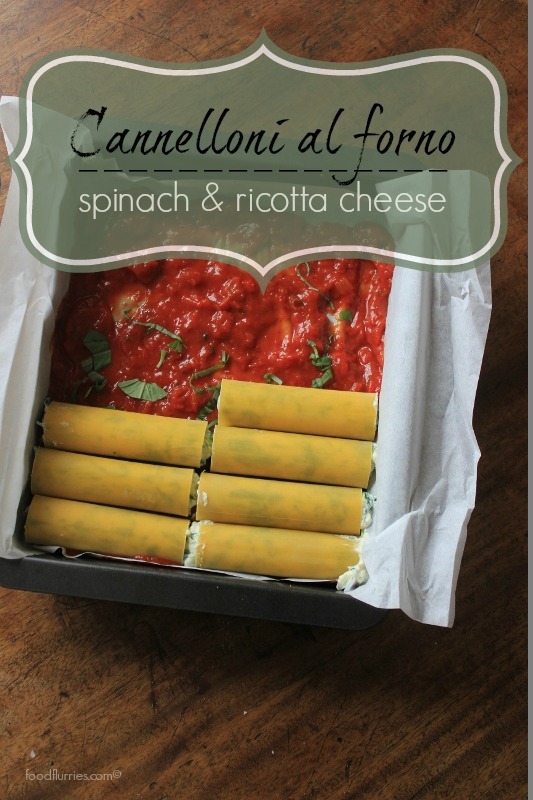 After posting about beef Stroganoff last week, today I bring you the comforts of Italy – cannelloni al forno with a classic spinach and cheese filling. I told R. that I was making this for dinner and he balked, of course, since there was going to be ‘the green stuff’ in his dinner. R. and vegetables don’t mix, so I was compelled to make second version for him, a minced turkey and sage variation just to please everyone at the dinner table. I have made this dish a number of times in the past and I have to say it never disappoints. I like to make a large batch then eat it over a period of days. Man, pasta is so good … God, bless Italian food! If I am honest I’d say I don’t really have much experience with Italian food other than having pastas and pizzas. I haven’t really done all that much travel through Italy itself and I feel I have barely even scratched the surface of their cuisine. Been to Italy twice now and I have to say if you think pastas and pizzas in Italian restaurants are good … well, you should try them when dining in Italy itself. OMG, food is good there! The first time we ever went to Italy is was about Feb 2012 – R. took me there as a Valentine’s Day gift and also to see snow-covered mountains. At the time we were living in Amsterdam where there are no mountains and very little snow fall during the winter months. We entered the Lombardi region via Switzerland on the Bernina Express and we spent the next 3 – 4 days on the shores of Lake Como. Such a wonderful time spent walking the streets of this town, made even more wonderful by the fact that it was not tourist season at the time. Food was good and cheap – I have never eaten a bowl of risotto as good since. 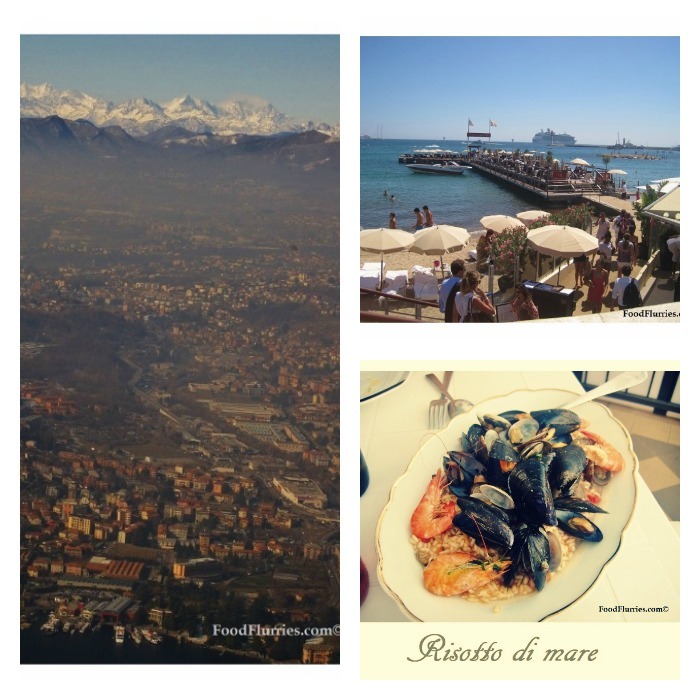 Northern Italy’s food is rich and full of depth, which I love very much. I like meaty dishes with velvety sauces and creamy desserts. Fast forward a year later and we find ourselves back in Italy, this time on the coasts of the Italian riviera armed with a sister and a dog. We stayed at an Airbnb rental and got fed a whole bunch of home cooked food by the owner. It was organic food and it was perfection … all this we ate while taking in the views of the olive groves and the Mediterranean sea in the distance. Coastal Italy eats very simply with a heavy emphasis on salads, fish and a whole bunch of olives and olive oil – the Mediterranean diet. Meals were quick and easy with light zesty flavours accompanied by piles of amazingly baked bread to sop up all the yummy juices with. If I got lots of time off work I think I would love to spend more of my holidays travelling Italy and getting to know the cuisines and food culture of each region. I want to visit Sardinia for example and just live of fresh seafood and take walks along the coast, see fishing boats haul up their daily catch and possibly be lucky enough to partake in some lightly grilled sardines that were only just caught. I want to walk the vinyards of Tuscany and see the stone farmhouses and wineries dotted over cresting hills. I have yet to lay my own eyes on the famous canals of Venice and the Trevi fountain in Rome – so that’s all going on the list. Am aware that all of Italy consumes pasta in one form or another, but what I want to experience are the pasta dishes that reflects the town and its history, its traditions and its people. Anything which is baked in a sauce, I’m in! Scrumptious food does not always have to be complicated. If fact many of the foods that I have had the pleasure of experiencing on my travels have been the simplest peasant food and they made the biggest impact on me. Always, in the words of the great Marco Pierre White, it’s all about “… good food, done well” – and that’s really all there is to it. This dish I am presenting today embodies all that sort of food philosophy. 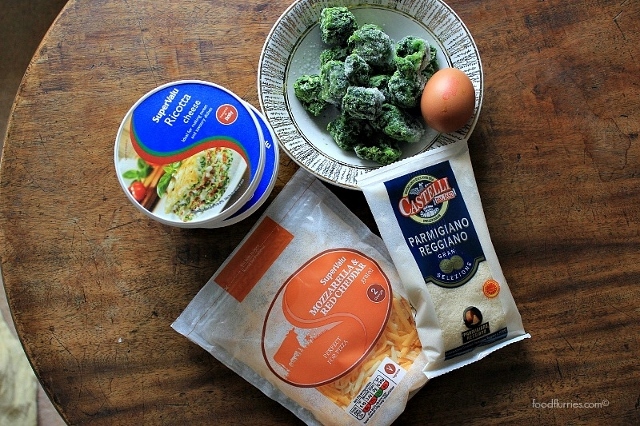 Ingredients are simple so you want to take the time to prep them properly, especially the bechamel. First off start with the bechamel sauce. Melt the butter in the pan and once bubbly, throw in the flour and whisk that around for a couple minutes to cook out the rawness. Add cold milk and stir thoroughly. Cook on medium until mixture thickens. Turn off the heat, add all the cheese. Season with salt. Next start the fillings. I made two fillings – one was the spinach and ricotta one and another minced turkey and sage because R. doesn’t go near anything that’s green. The pasta tubes are easy enough to get. You can either get the instant cook tubes or just plain lasagne sheets which you end up rolling into tubes once the filling is placed. Just mix all the ingredients in the fillings list and spoon into a piping bag. Trust me, this will help you fill the tubes MUCH MUCH quicker and without you losing your mind. Less clean up too! For the alternative filling I just used about 300 g minced turkey and mixed in a few other things like bread crumbs, sage, egg and garlic. A splash of fresh cream to loosen the mix if it gets too thick and claggy. I wanted a smooth puree-like consistency. 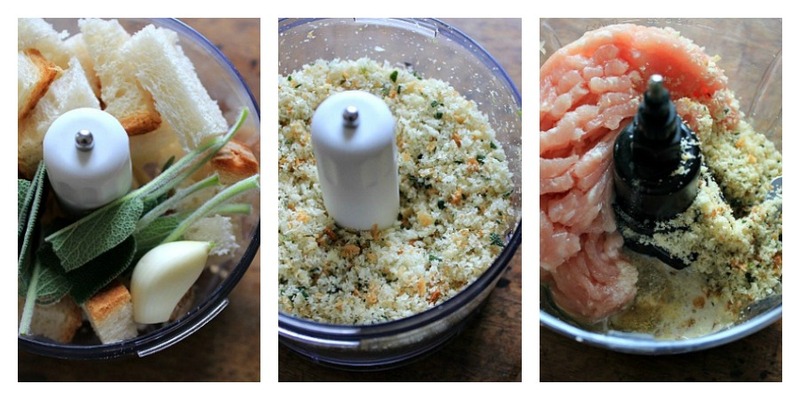 The breadcrumbs help the mix not be overly dry and meaty. I cut up the stale bread (about 2 days old) and placed it in a food processor along with a single clove of garlic and about 5 to 6 sage leaves. Blend to a fine crumb. 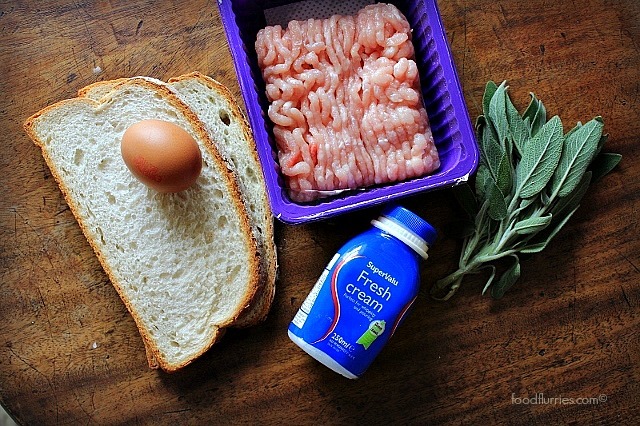 Then add the mince turkey, egg, cream and a pinch of salt into the same food processor. Pulse until well combined and has the consistency of mousse. 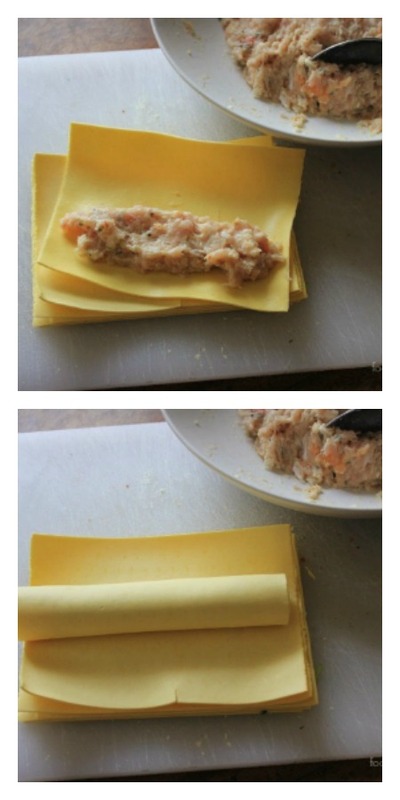 So once you get both your fillings done you can start with the process of filling up the pasta tubes. If you are also filling the mince turkey into store bought cannelloni tubes then go ahead and place the puree into another piping bag. 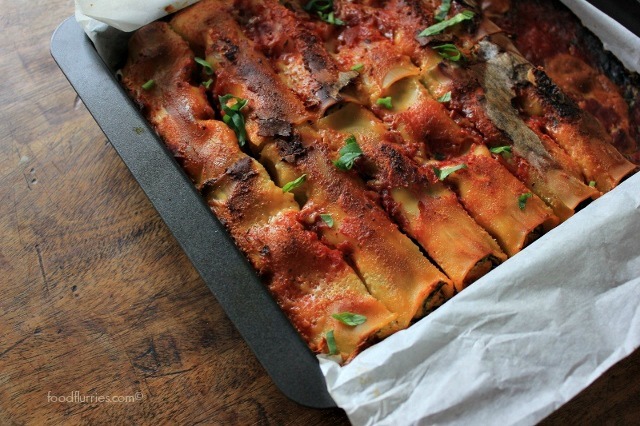 If you are going to be using fresh lasagne sheets like I am here, then just use a spoon. I know some recipes say to pre-boil the lasagne sheets just a little to soften them but I didn’t and they turned out fine, so long as you remember to put a bit of water into the dish before baking everything. I also put lots of tomato sauce into the baking dish which acts like a medium to gently steam and simmer the pasta to perfection. Place a good amount of your favourite pasta sauce base onto the bottom of a baking dish … I like mine to be fairly chunky, but feel free to use whatever tomato based sauce you prefer. Sprinkle a decent amount of chopped basil on the sauce then arrange your pasta rolls in the dish, lining them up side by side until you either fill the dish or run out of pasta tubes. 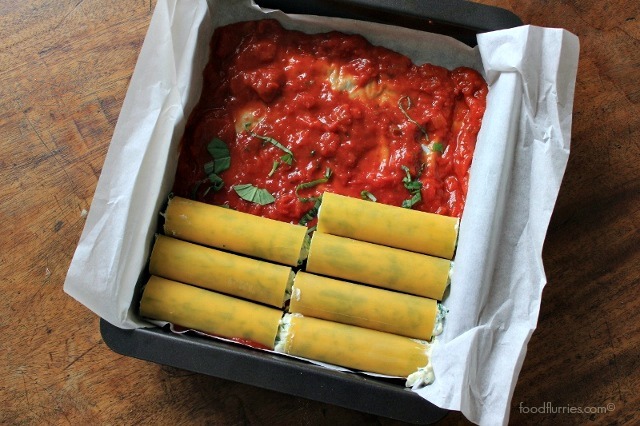 Top off the pasta rolls with a generous amount of more tomato sauce. Add about a half cup of water to the baking dish. Cover tightly with tin foil and shove it in the oven at 180ºC for 40 – 50 mins. Please note that in the picture I lined the bottom of my baking tray with parchment paper; DO NOT FOLLOW my lead. I only did this because I was being lazy and didn’t want to clean the pan after and thought putting down paper would be a very clever way around it. Sure it was, as long as you like wet paper sticking to your cannelloni tubes after cooking. So please please please just bake your pasta in a nice glass or ceramic baking dish or use a non-stick tray with a bit of PAM sprayed on the bottom. After the 50 mins is up and the pasta is cooked through, remove the foil cover and pour over the yummy cheese sauce, sprinkle a bit more of that garlicky breadcrumbs if you have leftovers and a bit more grated cheese. Broil for 10 mins until the cheese is bubbly and has a good grilled cheese colour to it. Allow the dish to cool for about 10 mins before you cut and serve. 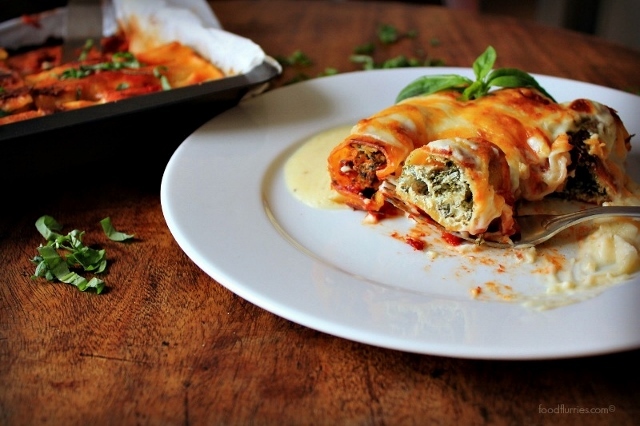 Garnish with more basil and enjoy this yummy dish. 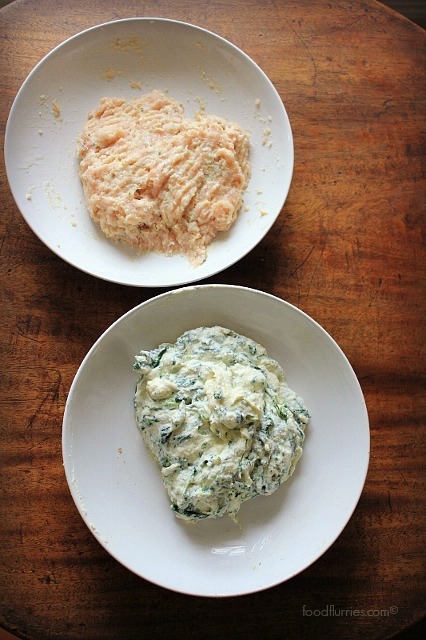 Serve with a simple salad and you will be all set for the evening. 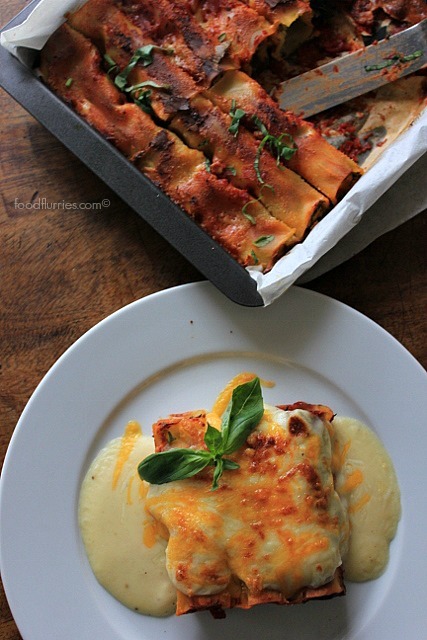 This dish, like lasagne, keeps well and tastes better after a couple of days in the fridge so it makes for awesome leftover suppers when you come home and are too tired to cook any thing new. Delicious for the kids as well. 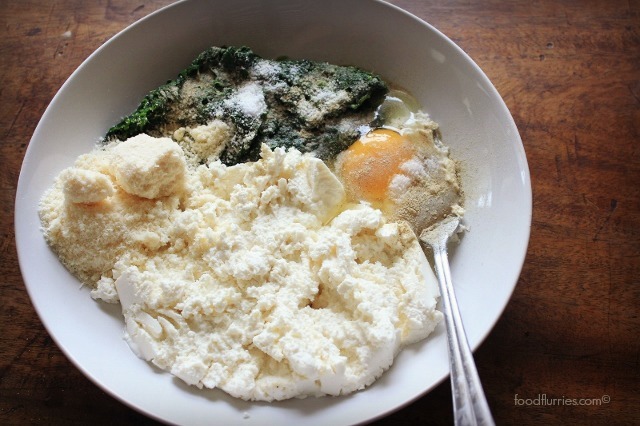 This dish is wonderfully comforting and so delicious, I really hope you guys try it and let me know how you get one. Until the next time … bon appetite!